Abstract: Background: The Western Ontario Rotator Cuff Index (WORC) is an assessment tool developed to evaluate quality of life in patients with rotator cuff disease (RCD). The purpose of this study is to translate the WORC index into Spanish and to evaluate its reproducibility and internal consistency in patients with RCD. Methods: Following guidelines from literature, the WORC index was translated. Sixty patients with RCD were asked to complete the questionnaire. To evaluate reliability, they were asked to answer it for a second time within the next 14 days. The Cronbach’s α (CA) and the intraclass correlation coefficient (ICC) were calculated to determine test-retest reliability and internal consistency. Bland-Altman plot and reliable change index (RCI) were used to evaluate measurement error. Results: Cronbach’s α was 0.96 for the total WORC score (ranges 0.85-0.94 for the five domains). Excellent test-retest reliability was seen with an ICC of 0.98, with the domains ranging between 0.91-0.97. The Bland-Altman plot showed no systematic differences, and the RCI for the total WORC index was 7.6%. Conclusion: The Spanish version of the WORC index is a valid and reliable tool for evaluating quality of life in patients with RCD and may be used in Spanish speaking countries like Colombia. Level of evidence: Basic Science Study, Development or Validation of Outcomes Instruments/Classification Systems. Keywords rotator cuff, test-retest reliability, reproducibility, quality of life. Resumen: Introducción: el Índice de Western Ontario para Manguito Rotador (WORC) evalúa la calidad de vida en pacientes con patología del manguito rotador. El objetivo de este estudio fue traducir la escala al español y evaluar su consistencia interna y reproducibilidad en pacientes con esta enfermedad. Métodos: siguiendo las guías de la literatura, se tradujo la escala de WORC y se aplicó a sesenta pacientes con patología del manguito rotador. Para evaluar la confiabilidad, los pacientes debían responder la escala por segunda vez, en un período no mayor a 14 días. Se calcularon el alfa de Cronbach y el coeficiente de correlación intraclase (ICC) para determinar la confiabilidad test-retest y la consistencia interna. El gráfico de Bland-Altman y el índice de cambio confiable (RCI) se usaron para calcular el error de medición. Resultados: el alfa de Cronbach fue 0,96 para el valor total del WORC (rango de 0,85-0,94 para los cinco dominios). La confiabilidad test-retest fue excelente con un ICC de 0,98 (rango de 0,91-0,97 para los dominios). El gráfico de Bland-Altman no demostró diferencias sistemáticas y el RCI fue 7,6%. Conclusión: la versión en español de la escala de WORC es una herramienta válida y confiable para evaluar calidad de vida en pacientes con patología del manguito rotador y puede utilizarse en países de habla hispana como Colombia. Nivel de evidencia: estudio de ciencias básicas, desarrollo o validación de instrumentos para medición de desenlaces. Palabras clave: manguito rotador, confiabilidad, reproducibilidad, calidad de vida. Rotator cuff disease (RCD) is a common pathology with a strong negative impact on patient’s quality of life. There are several tools that measure burden of disease attributable to RCD, both prior and after treatment interventions. 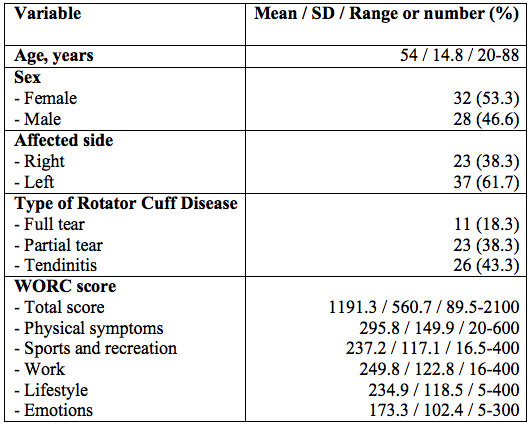 The Western Ontario Rotator Cuff (WORC) Index, developed in 2003, is an example of a tool that offers a good, reliable and valid way of measuring quality of life in patients with rotator cuff pathology. The intraclass correlation coefficient (ICC) for the original WORC index was excellent (0.96) (1). The WORC index has been successfully translated into several languages. Success was defined by high values (close to 1) of internal consistency and reproducibility scores, calculated through Chronbach´s α (CA) and interclass correlation coefficient (ICC). Some examples of CA and ICC for translations are as follows: the Dutch version obtained 0.97 and 0.94, respectively (2); the Persian version 0.92 and 0.90 (3); the Brazilian Portuguese version 0.97 and 0.97 (4); the Japanese version 0.95 and 0.84 (5); the Turkish version 0.92 and 0.98 (6); and the Norwegian version 0.91 and 0.84 (7). The German’s WORC index version was validated through CA and Pearson Correlation Coefficient, both of which had a value of 0.96 (8). All of the translations had similar results, confirming the good reliability of the WORC index across different languages. Given that RCD is a worldwide pathology, affecting also sufferers from Spanish speaking countries, it is important to have a tool such as the WORC index in Spanish, capable of assessing quality of life and measuring the burden of disease. However, many of the items in the questionnaire would get lost in translation if a mere conversion from English to Spanish of the index was created. The aim of this study is to translate and validate the Spanish version of the WORC score in Colombian population, with cultural adaptation of the index. Permission for translation and cultural adaptation was requested to the original WORC index authors. Once permission was granted, two different healthcare professionals, whose first language is Spanish (a general practitioner and an orthopedic surgeon), did two independent forward translations, following the guidelines found in medical research literature (9,10). These forward translations were as close to the original as possible, bearing in mind that they needed to be culturally adapted translations rather than literal ones. The two translations were then compared and merged into a single version, which was then translated back into English by a translator and a general practitioner whose first language is English. After conciliation by the whole group, this trial version was applied to a pilot group of 5 patients. Final corrections were made, thus obtaining a definite version, which was also approved by the original WORC index authors (see Spanish final version in appendix). A total of 60 Spanish-speaking patients from Fundación Valle del Lili (Cali, Colombia), with rotator cuff pathology (tendinitis, partial tear or complete tear) were included in the study. Inclusion criteria were: age older than 18 years plus confirmed diagnosis of RCD by clinical history, physical examination and magnetic resonance evaluation. Only illiterate patients were excluded. Patients were recruited between December 2012 and December 2013 by two orthopedic surgeons who identified eligible patients from the outpatient clinic. The ethics and biomedical investigation committee of Fundación Valle de Lili approved the study prior to its initiation. Sixty patients were asked to complete the Spanish version of the WORC index. Within a 14-days period, they were asked to complete the WORC index for a second time, with the purpose of carrying out the reliability test. The WORC index is a self-assessment instrument that has been used to evaluate quality of life in patients with RCD. It consists of 21 items distributed in 5 domains: 6 questions of physical symptoms; 4 questions of sports and recreation; 4 questions of work; 4 questions for lifestyle and 3 questions about emotions. Each item is answered on a 100 mm visual analogue scale (VAS). The highest or most symptomatic score is 2100 and the best or asymptomatic is 0, which implies no reduction in quality of life (1). The Stata version 12.0 was used for the statistical analysis. Demographic and clinical characteristics of the study population were included. Means, rates, ranges and proportions were calculated for these variables (Table 1). Reproducibility refers to the way in which repeated measurements give similar values. It is measured in terms of the internal consistency and reliability of the instrument. Cronbach’s α (CA) measures the internal consistency of the instrument. It was used for the WORC index’s total score and for each domain. It ranges from 0 to 1, and a value of 0.7 or more indicates adequate internal consistency. The test-retest reliability is calculated with the intraclass correlation coefficient (ICC). Values range from 0 to 1, and values above 0.80 are considered to have excellent reliability. The Bland-Altman plot is used to evaluate possible systematic variations in the difference between measurements. 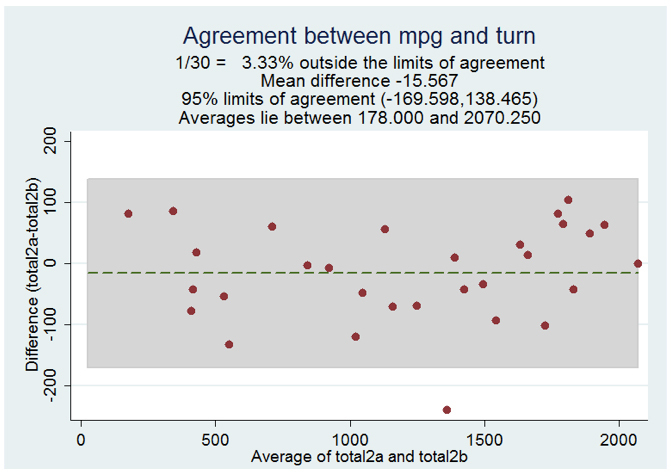 It also allows identifying outlier values not recognized by the correlation analysis. The reliable change index (RCI) was also calculated as an indication of the measurement error. RCI is calculated by the formula: 1.96 × Ö2 × SD, where SD is the square root of the variance. A total of sixty patients (28 men, 32 women), mean age of 54 years (20-88), fulfilled the inclusion criteria and were included in the analysis. Table 1 shows the baseline characteristics of the study population and the mean values of the total WORC score and for the 5 domains. The internal consistency of the Spanish version of WORC index measured through Cronbach’s α was 0.96 for the total score, range 0.85-0.94 for the five domains, indicative of a high internal consistency. Excellent test-retest reliability was seen through an ICC of 0.98, range 0.91-0.97 for the five domains (Table 2). The reliable change index (RCI) for the total WORC index was 7.6%. The Bland-Altman plot showed no systematic differences between the first and the second measurement for the Spanish WORC index total score (Figure 1) or between the individual domains. Rotator cuff disease is the most common cause of shoulder pain. It affects negatively the patient’s quality of life, both in the work environment and daily activities. The original WORC index score is a practical and reliable tool for measuring the negative impact of RCD on patient’s lives. Thus a need to translate it into Spanish was imperative. Translation was completed using a systemic standardized approach. Internal consistency was measured through Cronbach’s α, which yielded a value of 0.96 for the total WORC index score. This is comparable to results obtained in other versions of the WORC index and in the original English version (1,2,3,4,5,6,7,8). However, this high result could be influenced by the similarity between questions. High intraclass correlation coefficients representing good test-retest reliability were obtained in this study (Table 2). The study population was heterogeneous, and this may result in higher values of ICC than those obtained from homogeneous groups. In addition, heterogeneous groups represent the diversity of the actual clinical setting, which in turn translates into more reliable results. Once again, results were similar to those obtained in other studies. The Bland-Altman plot does not show systematic differences or biases between the first and second measurements of the WORC index, showing adequate internal validity for the measurements. The repeatability coefficient measured with a 7.6% reliable change index, shows no statistically significant difference between the first and second set of measurements. The study limitations were given by the lack of comparison with other scales used for the same purpose, such as the Shoulder Pain and Disability Index, RC-QOL or the Oxford Shoulder Score. Such comparison would help to know which one is the most reliable and consistent of these tools. Though, this comparison was not possible because there were no published Spanish versions available for those scales when this study was conducted. The time span between measurements in the same individuals was between 0-14 days with a mean interval of 2 days; this short interval might relate with the similarity of response and the higher value obtained for the ICC. Nevertheless, longer periods of interval could show differences related to the treatment that patients are receiving and affect negatively the score’s reliability. The Spanish version of the WORC index is a reliable, consistent and valid instrument for evaluating quality of life in patients with rotator cuff disease in Spanish speaking countries such as Colombia. 2. Wiertsema SH, Rietberg MB, Hekman KM et al. Reproducibility of the Dutch version of the Western Ontario rotator cuff Index. J Shoulder Elbow Surg [Internet]. 2013;22:165-70. doi: 10.1016/j.jse.2012.03.014. 3. Mousavi SJ, Hadian MR, Abedi M et al. Translation and validation study of the Persian version of the Western Ontario Rotator Cuff Index. Clin Rheumatol [Internet]. 2009;28:293-9. doi: 10.1007/s10067-008-1042-6. 4. Lopes AD, Ciconelli RM, Carrera EF, et al. Validity and reliability of the Western Ontario Rotator Cuff Index (WORC) for use in Brazil. Clin J Sport Med [Internet]. 2008;18:266-72. doi: 10.1097/JSM.0b013e31817282f4. 5. Kawabata M, Miyata T, Nakai D, et al. Reproducibility and validity of the Japanese version of the Western Ontario Rotator Cuff Index. J Orthop Sci [Internet]. 2013;18:705-11. doi: 10.1007/s00776-013-0426-x. 6. El O, Bircan C, Gulbahar S et al. The reliability and validity of the Turkish version of the Western Ontario Rotator Cuff Index. Rheumatol Int [Internet]. 2006;26:1101-8. doi: 10.1007/s00296-006-0151-2. 7. Ekeberg OM, Bautz-Holter E, Tveitå EK et al. Agreement, reliability and validity in 3 shoulder questionnaires in patients with rotator cuff disease. BMC Musculoskelet Disord [Internet]. 2008;9:68. doi: 10.1186/1471-2474-9-68. 8. Huber W, Hofstaetter JG, Hanslik-Schnabel B, et al. [Translation and psychometric testing of the Western Ontario Rotator Cuff Index (WORC) for use in Germany]. Z Orthop Ihre Grenzgeb. 2005;143:453-60. PMID: 16118762. 9. Guillemin F, Bombardier C, Beaton D. Cross-cultural adaptation of health-related quality of life measures: Literature review and proposed guidelines. J Clin Epidemiol. 1993;46:1417-32. PMID: 8263569. 10. Wild D, Grove A, Martin M, et al. Principles of good practice for the translation and cultural adaptation process for patient-reported outcomes (PRO) measures: Report of the ISPOR Task Force for Translation and Cultural Adaptation. Value Health. 2005;8:94-104. PMID: 15804318.
a MD. MSc., Department of Orthopedics and Traumatology, Fundación Valle del Lili, Cali, Colombia. b MD. Clinical Research Center, Fundación Valle del Lili, Cali, Colombia. c MD. Clinical Research Center, Fundación Valle del Lili, Cali, Colombia. d BSc. Clinical Research Center, Fundación Valle del Lili, Cali, Colombia. e Sociology Student, Harvard University, Boston, USA. f MD. Department of Orthopedics and Traumatology , Fundación Valle del Lili, Cali, Colombia.